Ventura Storm is on top of the 2017 Caulfield Cup tips of form expert Deane Lester and he has a big opinion of the imported stayer heading into the Group 1 event at Caulfield this afternoon. Ventura Storm made his Australian racing debut with a promising fifth in the Archer Hall Of Fame Trophy at Flemington on May 20 and he has improved each time he has been seen at the races during the 2017 Spring Racing Carnival. The Zoffany gelding finished seventh in the Listed Heatherlie Stakes (1700m) at Caulfield on September 2and sixth in the Group 1 Makybe Diva Stakes (1600m) at Flemington on September 16 before he chased home Winx in the Group 1 Turnbull Stakes (2000m) at Flemington on October 7. Lester believes that Ventura Storm has had an ideal preparation for the Caulfield Cup and he fancies him as the horse to beat in the Group 1 event. “I am with Ventura Storm,” Lester told RSN. “I think that he will get a great run and Ollie (Damien Oliver) can win a fifth Melbourne Cup. “He has been waiting a while and this is his chance. “From the first time that we saw him through the winter and his three runs during the Spring have done nothing to dent my confidence in him. 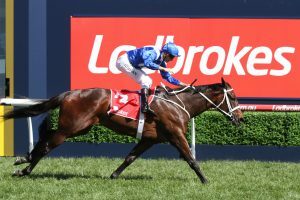 Johannes Vermeer is currently on top of the 2017 Caulfield Cup betting market with Ladbrokes and Lester believes that he is the main danger to Ventura Storm. The Aidan O’Brien-trained galloper has performed well at Group 1 level in Europe and Lester was very impressed with his second place finish in the Group 1 Ladbrokes Stakes (2000m) at Caulfield last weekend. “It was an outstanding run last week and he only has to back that up,” Lester said. Johannes Vermeer is currently available at 2017 Caulfield Cup odds of $4.40 with Ladbrokes and he is a clear favourite from Australian Oaks winner Bonneval ($7.50), Darren Weir-trained Humidor ($8.50), talented stayer mare Amelie’s Star and Naturalism Stakes winner Harlem ($10).